Another one of Pansonic's latest addition to their digital camera line-up is the Panasonic DMC-FX35 . This is the company's first digital camera to feature a 25mm ultra-wide lens. The Ultra-wide lens on the Panasonic DMC-FX35 would enable consumers to capture almost double the frame size of ordinary digital cameras which means you can squeeze in more number of people in a group shot. 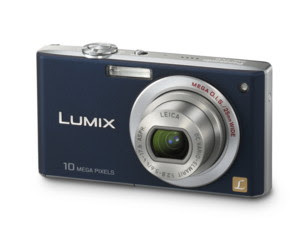 The Panasonic Lumix DMC-FX35 has a 10.1 effective mega pixel and a 4x optical zoom lens, and a fourth generation Venus Engine image processor. For novice photographers or those who just want a point and shoot camera, the Advanced Intelligent Auto Mode on the Panasonic DMC-FX35 would be a great help. This technology enables you to take superior image quality without going through manual settings as it automatically detects the environment, subject, background, etc, and adjusts settings such as white balance, exposure, camera shake, face detection, etc. Panasonic claims that the shutter release time lag on the Panasonic DMC-FX35 is as short as .005 seconds and it can also capture 2.5 shots per second and an unlimited consecutive shooting that allows users to take continuous shots until the memory card becomes full. The Panasonic DMC-FX35 has a 2.5 inch LCD screen that can detect lighting conditions and adjust the brightness of the LCD accordingly and the high angle mode on this device can make viewing the LCD screen easy when shooting over crowds. Viewing your photographs in slide show on the Panasonic DMC-FX35 can also be fun as you can add music effects while viewing your photos. The Panasonic DMC-FX35 can record 720p high definition motion pictures and 1920 x 1080 pixel photos so you can enjoy watching your pictures and video clips on your HDTV by using the optional component cable. However, if your HDTV has an integrated Memory card slot, just plug in the SD or Memory Card from your Panasonic DMC-FX35 and you can view your photos in High Definition without need of the component cable. The Panasonic DMC-FX35 will be available in silver, black and blue colors starting March 2008 and has a retail price of $349.95.